The International Language School Frankfurt has recently acquired the services of two qualified lawyers who are also skilled language teachers, a rare combination indeed. We are therefore now able to offer really highly qualified training in most aspects of the law. 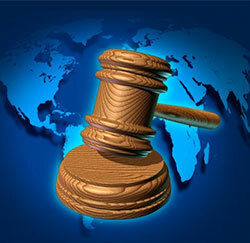 Our typical clients are German lawyers, law students and those working in the legal section of large companies. The aim of our courses is to improve English communication skills, improve the understanding of the written text and to learn the techniques for drawing up contracts and other legal documents. ILSF is an officially recognised „PLEAD School “ offering a unique blended learning course for law students and lawyers wishing to study Legal English. PLEAD combines live instruction carried out by our language teachers based on the International Legal English course book, supplemented by an extensive online course developed by Cambridge University Press, the Boston University School of Law and Translegal. The blended Learning approach makes our Legal English training even more attractive, enabling our students to supplement the skills training provided by us by learning legal terminology at times and places convenient to them. To round off our very comprehensive range of legal English Courses ILSF also offers courses covering the complete range of TOLES Legal English examinations. This means, no matter what your present level of English we have the right course for you. ILSF is, of course, a recognised TOLES Testing Centre and all the exams can be taken here in the school.